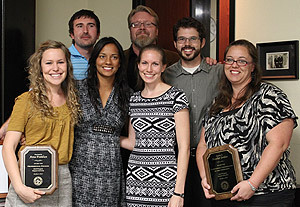 REDDING, Calif. - Seven graduate students were honored for achievements in Simpson University’s Master of Arts in Counseling Psychology program during an evening reception last week. About 80 people attended the Oct. 4 ceremony inside the J.D. Williams Suite in the Owen Student Services Center. In addition to the students, an MACP faculty member and clinical supervisor were honored, and a county public health analyst was named Community Member of the Year. Vanessa Areiza, for her commitment to work with diverse and marginalized populations. Justin Dobrenz, for excellence in clinical practice. Heather Jordan, for outstanding contribution to the community. Anna Frandsen, for professional promise. Roy Dyer, for theoretical application in clinical practice. Amanda Lockman, for professional growth. Dan Marshall and Vanessa Areiza, for achievement in thesis research. The program named Charlene Ramont as its Community Member of the Year. Ramont is a public health program and policy analyst at Shasta County Public Health who leads sessions for each MACP cohort on issues related to poverty. MACP adjunct faculty member Lisa Jellison was honored for Excellence in Teaching; and Jeannie Jacobs was named Clinical Supervisor of the Year. Simpson University’s M.A. in Counseling Psychology program began in January 2010. It has 27 current students and has graduated 28. The rigorous program is designed to prepare students for licensure in California as marriage and family therapists or licensed professional clinical counselors. Learn more at simpsonu.edu/macp. Photo by Jessica Law. Back row, from left: Dan Marshall, Roy Dyer, and Justin Dobrenz. Front row: Anna Frandsen, Vanessa Areiza, Amanda Lockman, and Heather Jordan.